The Keep Pecos Proud Committee feels that a cleaner and more beautiful Pecos is a great asset in attracting people and businesses while instilling a greater pride in our town. Keep Pecos Proud’s Adopt-A-Spot is a program that encourages community ownership of public areas and to prevent littering through beautification and maintenance. Volunteers are responsible for picking up thousands of pounds of litter each year from Pecos’s roadways, contributing to a cleaner, more beautiful town; a higher quality of life for residents; and a vibrant local economy. Being an adopter gives participants opportunities to give back to the community, teach their children about community responsibility, receive positive publicity for their business, and gain valuable community service experience. Participants commit to a two year investment and must clean up their spot a minimum of 6 times per year. Contact the Pecos Area Chamber of Commerce today at 432-445-2406 and sign-up. orts in maintaining their property, contributing to the overall appearance of our town. The program and award are administered entirely by volunteers. March through October, the KPP committee will choose a lawn that best typifies the qualities of: uniqueness, beauty, appeal, and consistency with the guidelines. Since the KPP committee deals mainly with “curb appeal,” nominations will be for front and side yards jointly, as well as the exterior of the house or building. The committee will select one residential and one business landscape during the first days of each month. The winners are provided a decorative yard sign for display showcasing their winning yard, a posting and photo on our community website, and an announcement in the Pecos Enterprise Newspaper. Have you seen a yard that’s worthy? Download the nomination criteria and submit your nominations by e-mail to infopecostx@gmail.com. 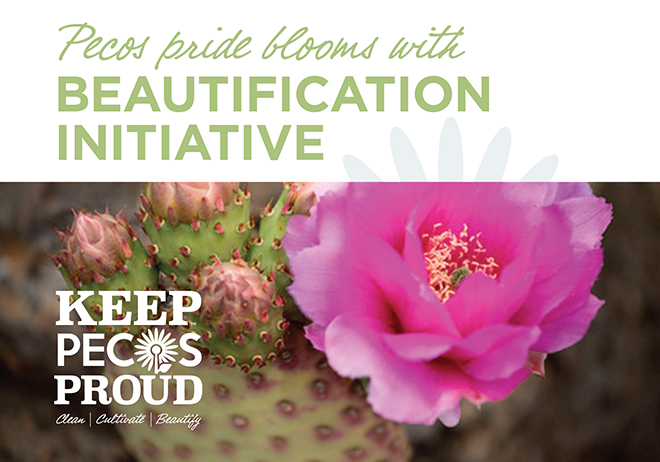 BEAUTIFICATION | KPP beautification programs will contribute to our vision of making Pecos the cleanest, most beautiful town in the state. , KPP will assist in removing litter from our community. YOUTH & EDUCATIONAL PROGRAMS | From the Young Environmental Leaders to the Waste In Place curriculum and Patch Program, Keep Texas Beautiful youth programs are fostering budding environmental stewards and ensure a bright future for Texas! 100 E Dot Stafford St.